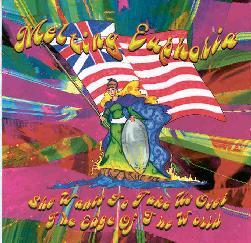 Melting Euphoria - "She Wants To Take Us"
Melting Euphoria's follow up to 1997's Inside The Gardens Of The Mind offers more of the jamming instrumental spacerock that the previous effort had. ME has developed a standard sound that works well but changes little from song to song (can you say Ozrics?). However, it's to the bands credit that the sound they have established is a recognizable one. ME's signature sound is most characterised by the Merrill/Anthony Who? rhythm section of pounding tribal drums and low end driving bass. Joining them are, once again, Zero on synths and harp and Bob Clic on guitars and mandolin. There are ten songs on the CD though the liner notes only list nine so my descriptions may not match with the titles I'm discussing. In any event, ME plays much shorter songs than instrumental spacerock bands typically do (4-6 minute range) which isn't a bad thing given that their strength is in making limited instrumental statements rather than extended thematic development, though there's more of that on this release than the previous one. Songs like "Surrounding Yesterday", Portals Of The Past", and "Tabs Of Blue And Silver Sunshine" are standard ME rockers though Tabs features some cool wah-wah'd guitar freakout moments. "Flying Eyes Like Saucers" offers a little more variety than other tracks. It's got an extended intro with cool pounding tribal percussion and acidic licks that say more in single notes than a lot of the more spitfire wailing solos. "Twilight Under Western Skies" stands out as a more hard rockin' tune than I've typically heard from ME. And "Field Of Reeds" at 12 minutes is the band's one foray into an extended journey as they travel though multiple psychedelic themes that held my attention most of the time. I think the band does well within the timeframes they typically stick with, and they seem to be aware of this, but it's nice to see them stretch out a bit for a change. Overall this new release is exactly what Melting Euphoria is... good jamming spacerock, best enjoyed live.